Surprised to see so many DW fans on CP. Really cool. BTW, my ranking of the new companions: Rose, Donna, Amy, Martha. Hard to believe she is gone. I may have to tune out the Office episodes in a few weeks when she shows up. I really, really, reallyreallyreally hope she's not Michael's replacement. Who are you talking about? Donna? Yeah, she's guesting in the Office season finale and could potentially be Michael Scott's replacement. Wow, I can't believe I hadn't heard this. I figured the Will Ferrel bit was just a red herring, but I hadn't heard about her. While Amy is my current favorite, I can understand how one could argue for either Rose or Martha. Donna is, shall we say, not traditionally pretty. Plus her character is soooo obnoxious that it makes it incomprehensible to me how anyone can put her anywhere but last. I love that they have a typo in the description and call themselves "balstr". Donna Noble was just incredibly obnoxious. She could've looked like Elle McPherson in her prime and it would've made zero difference. Looks like the 4th episode of this season was written by Neil Gaiman. Pretty serious potential. freema agyeman is beautiful. billie piper isn't bad, although i don't like blondes as a rule. 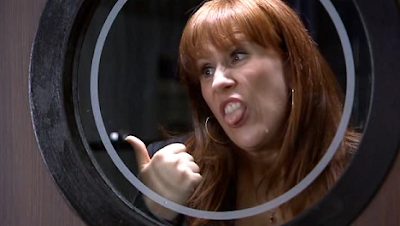 catherine tate makes me want to scoop my eyeballs out with a rusty spork. You like the horse-face look huh? I like it on my quarterbacks but not so much on women.